FOR IMMEDIATE RELEASE –March 14, 2012 – Binghamton , NY – SunMaxx Solar, a leading, vertically integrated manufacturer of solar thermal systems and components, is pleased to announce that the company’s solar hot water systems and collectors have satisfied all of the requirements of the SRCC OG-300 program and are now certified. The certifications have been posted on the SRCC website and can be viewed at www.solar-rating.org/ratings/ratings.htm. The Solar Rating and Certification Corporation, a non-profit organization whose primary purpose is to provide authoritative performance ratings, certifications and standards for solar thermal products, operates with the intention of protecting and providing guidance to consumers, incentive providers, government, and the solar energy industry. 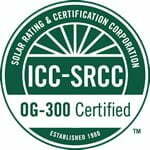 A list of SunMaxx Solar products have that have received the SRCC certification can be found at www.solar-rating.org. SunMaxx Solar will continue to develop and help procure the installation of solar thermal systems across the nation. SunMaxx Solar aims to build a sustainable future for our global community and is proud that the company’s installations greatly contribute to reducing our carbon footprint. In today’s energy consuming world, SunMaxx offers world-class solar and renewable energy products, striving to meet the increasing need for alternative energy sources. For more information, contact marketing@sunmaxxsolar.com.